Dubai, April 29, 2015: The 15th edition of Airport Show, scheduled to take place at the Dubai International Convention and Exhibition Centre (DICEC) from May 10 to 12, will see an all-time record participation of 127 Hosted Buyers, confirming its strong position as an ideal B2B event for the airport industry and reflecting the immense business opportunities offered by the Middle East region. “The industry’s growth will be reflected in the Airport Show 2015 with more exhibitors, hosted buyers and exhibition space. The event will bring international aviation experts and leaders to Dubai for an unparalleled knowledge and expertise sharing experience,” remarked Sheikh Ahmed under whose patronage the event takes place. This year’s event will have 127 hosted buyers, a 38 per cent increase compared with the previous year. The number of companies and authorities participating in the programme has increased to 53, a 55 per cent jump from last year’s edition. The number of countries which will be represented in the programme has gone up by 67 per cent to 30. This year, the organizers have also introduced a ‘Meet the Buyer’ programme for the Ground Handling, Air Traffic Management (ATM) and Aviation Security segments. The new countries that will be participating in the Hosted Buyers programme are: Algeria, Armenia, Bangladesh, Botswana, Ethiopia, Iraq, Lebanon, Malawi, Maldives, Moldova, Qatar, South Africa, Sri Lanka and Tanzania. The countries returning to the 2015 edition are Bahrain, Egypt, India, Jordan, Kuwait, Libya, Morocco, Oman, Pakistan, Saudi Arabia, Sudan, Tunisia, Uganda and Zimbabwe, along with the host, UAE. Taking place on over 12000 square metre gross exhibition space, the Airport Show will showcase the latest technologies and innovation that will change the way people travel through the airports now and in the near future. Over 275 exhibitors from over 40 countries will be participating at the show, which is expected to attract the attendance of over 7000 industry professionals. Daniyal said deal values are not disclosed at the show for confidentiality purposes, - however many contracts are materialized in the months following the event. As an indication, the authorities, project managers and contractors representing over $100 billion in regional airport development over the next five years will be attending this edition of the event. 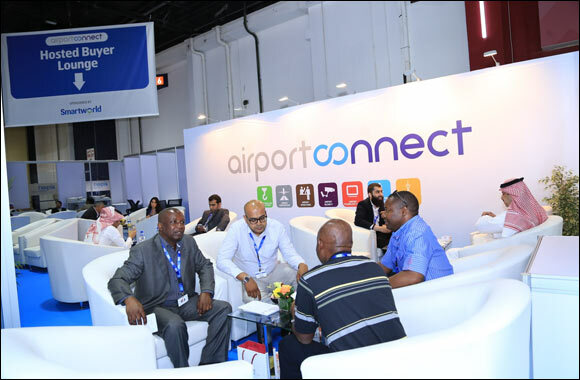 The Hosted Buyer Programme has been a highly-acclaimed feature of the iconic event since 2009, providing exhibitors an unparalleled opportunity to meet key officials and decision-makers from regional airports. The Arab Air Carriers Organization (AACO) said the number of passengers flying through Arab airports will grow to 571 million by 2026. Emirates alone is expected to carry 80 million passengers by 2020. Etihad Airways, flydubai, Air Arabia and Qatar Airways too have ambitious growth agendas. Analysts at TechNavio, an Airport Show partner, forecast the aviation market in the Middle East to grow at a CAGR of 5.12 percent over a five year period ending 2019. According to a 2015 construction projects report by CAPA, the total value of airport construction projects globally is worth $543 billion, up from $385 billion identified in January 2014. Of this, the Middle East’s share is $84.5 billion, it said, noting that the majority of the most expensive projects are in the Middle East and Asia Pacific.